How Do You Make Mountain Dew Glow in the Dark? Soon after the "Diet Coke and Mentos" phenomenon swept the nation, several clever individuals claimed to create a glowstick using Mountain Dew, baking soda and hydrogen peroxide. Videos of the supposedly legitimate chemical reaction popped up on YouTube, but it was only a matter of time before someone discovered the secret to making Mountain Dew glow. Truth be told, baking soda is irrelevant and the YouTube hoaxers neglected to mention an essential ingredient. 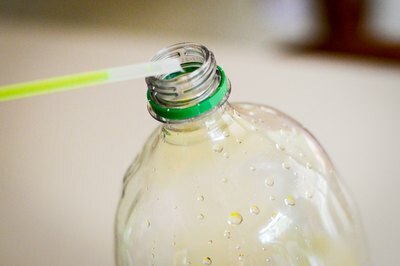 Pour 3/4 of the Mountain Dew into another container, as you only need a small amount in the bottle. Remove the tip from a green glowstick with sharp scissors. Do not break the glass capsule inside the stick. 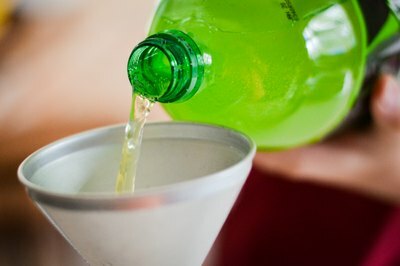 Pour the liquid contained within the glowstick into the Mountain Dew bottle. Ensure that the glass capsule stays inside the plastic glowstick. 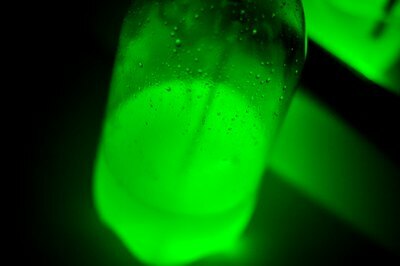 Swirl the contents of the bottle together to initiate the chemical reaction and cause your bottle to glow. Pour the liquid contents of several glowsticks into your bottle for a brighter reaction. 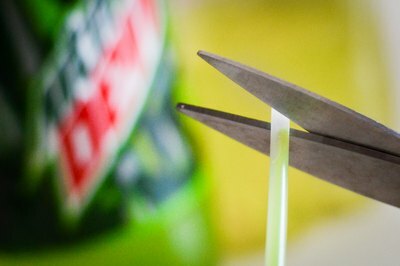 The Mountain Dew itself plays no role in the chemical reaction; it simply has the same color as glowsticks. Use caution when cutting open the glowstick, as the contained liquid will stain any fabric it touches.